Twenty-one years ago Charlie and Mary Parkhill were a carefree couple on vacation in Mexico. Charlie Parkhill: I was taking a swim in the morning and a wave came up behind me picked me up dropped me on my head and that’s what compressed my spinal cord. I was totally paralyzed from the shoulders down. Charlie was medevac’d back to the States and underwent several surgeries. The doctor’s were not optimistic about his recovery and delivered a grim prognosis to his wife Mary. Mary Parkhill: When I finally got to see him the next day he just looked at me and he said I’m going to get better. Charlie began intensive therapy and with time managed to walk more than 100 feet, unassisted. He was defying the odds but when he heard another patient’s treatment was ending due to insurance cuts he knew he had to do something. Charlie Parkhill: This family was devastated and I went home to Mary and I said this could be our cause if we could find a way where people wouldn’t have to hear that. So began the Mary and Charles A. Parkhill Foundation, which grants money to people with catastrophic injuries for continued therapy when other funding has lapsed. So far they’ve raised close to 600 thousand dollars. Mitch: So you raise the money and then you give the money away essentially. Charlie: We give it all away. 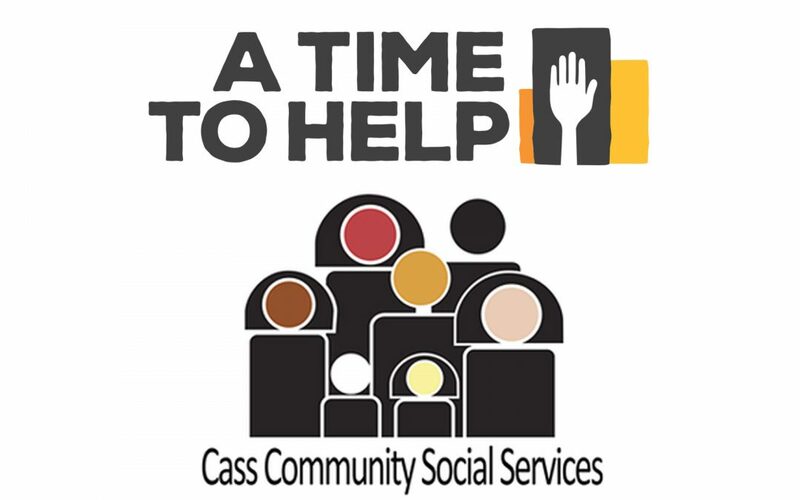 Over 80 grants so far in the 12 years we have been doing this. Mitch: Whose lives have been affected by your generosity. Mary: I wish we didn’t have to have this foundation because you don’t know what its like until you’re in that world so if we can if we can help someone it’s the best. 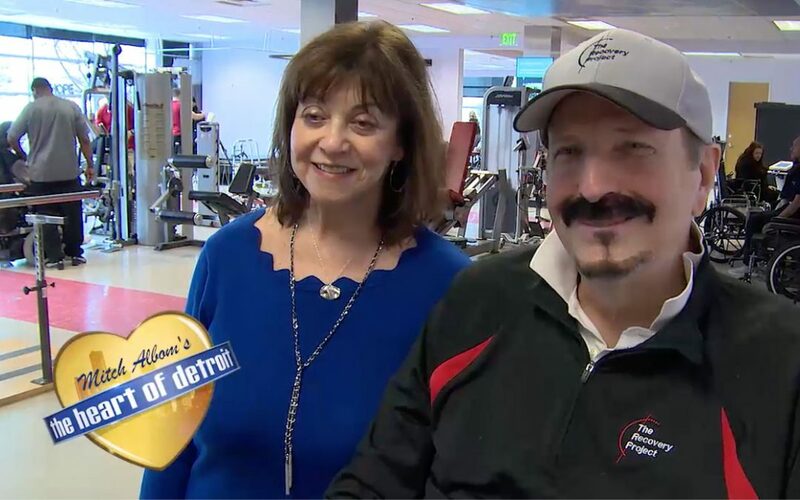 Charlie and Mary Parkill are turning a tragedy into hope for others with catastrophic injuries here in the heart of Detroit. Sister Judie always knew she wanted to be a nun. Widowed and with her six children grown she followed her calling and joined the Felician order. Then she met a young mother in need. Grace Bayer: She saw a woman eating out of a dumpster feeding her child and she said I need to do more. Sister founded the Sisters of Christian Love with a mission to feed the hungry. Grace Bayer was a volunteer. Grace Bayer: She was just so kind and loving and I was really impressed with her and how she was so selfless. Sadly, Sister Judie passed away in February of 2018 but those that she served continue to receive the love and support she provided thanks to Grace and the team of volunteers at Sister Judie’s Outreach. 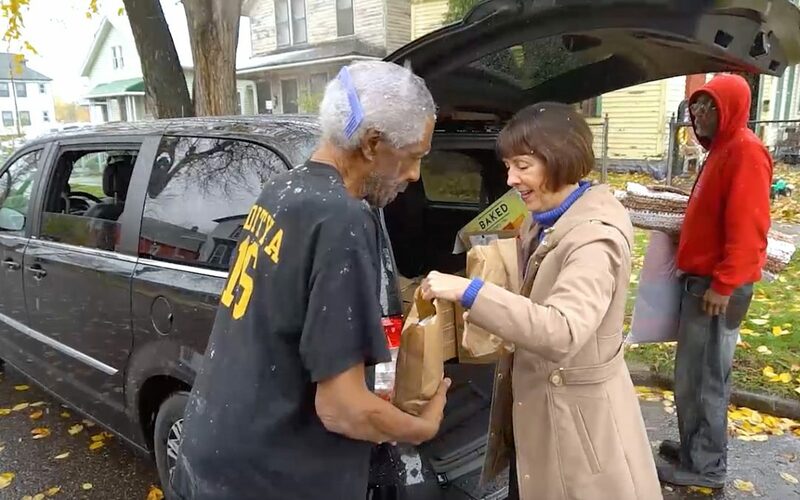 Grace Bayer: We make between 125 and 150 lunches every day Monday thru Friday and deliver them to people in the Eastern Market area of Detroit and then we also give out underwear socks, t-shirts, hats gloves, coats. Mitch: And what’s been the most rewarding part of it for you? Grace Bayer: People telling you you know thank you so much you don’t know what this means to me um God bless you and it just kind of makes your day you know just knowing that you’re helping someone. Mitch: If you could talk one more time with the real Sister Judie what might you say to her or ask her? Grace Bayer: I would say are you proud of me? Mitch: What do you think she’d answer? And we would agree. Carrying on the blessing of a Godly woman, Grace Bayer is feeding the less fortunate here in the heart of Detroit. 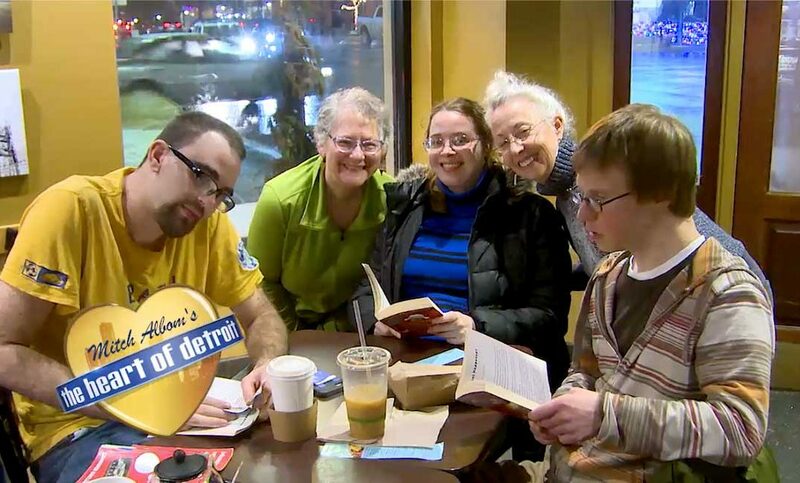 Every week a group of avid readers meet at the Bean and Leaf in Rochester to discuss their latest book club selection. Beth Monroe: Our members rarely miss a week and for five years they have been steadfastly attending so it means a lot to them it’s a highly anticipated social event every week. This in demand social event is The Friends Book Club. The club was founded five years ago by Deb Motley, Beth Monroe and Beth’s daughter Emily who has Down Syndrome. The club has read over 20 novels – from classics to current titles. Beth Monroe: My daughter who is a member has become a better reader she chooses to read on her own time frequently now she remembers what she read and can discuss it and it has also taught her to have opinions about something that took place in a book. Mitch: And what was your first book that you selected?….Tuesdays with Morrie? Maybe they haven’t read Tuesdays with Morrie yet but they have tackled Oliver Twist, Harry Potter and Secret Garden just to name a few. The best part of the book club is the members are making lasting friendships. Deb Motley: These group of people didn’t know each other very well before the book club. Just seeing the enjoyment that everyone has being together and reading together and discussing the books and having a relationship with each other I think that’s what really makes me come back every week. 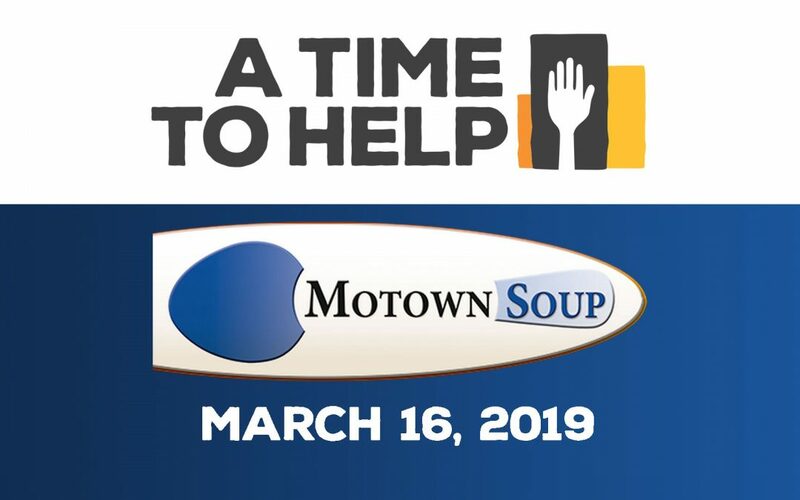 Learning through reading and prospering every week, Deb Motley, Beth Monroe and The Friends Book Club are sharing a good book with a special community right here in the heart of Detroit. 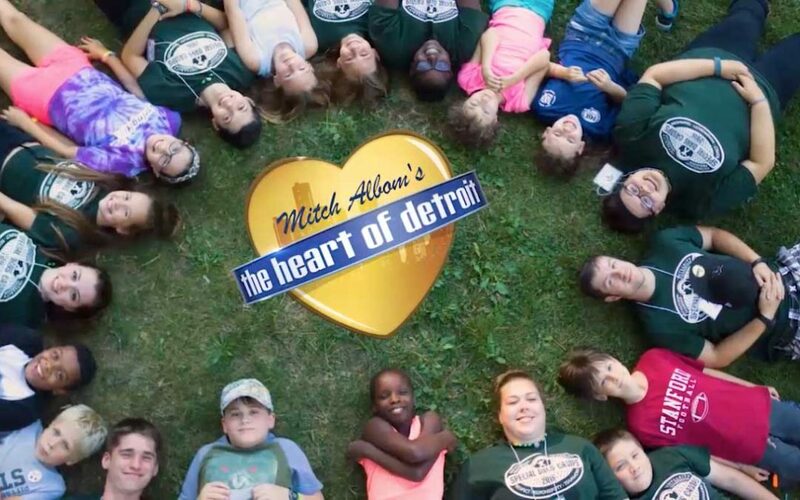 Michigan is home to Special Days Camps, one of the longest running pediatric oncology camps in the world. It’s a unique place where not only do kids with cancer get to be kids, but siblings are also welcomed. An experience that Dawn Cross shared with her brother. Dawn Rauser Cross: I had a brother diagnosed with Leukemia when he was three and it was my brothers first experience and my mom said he was crying he just wanted to leave with her and a week later when she came back to get him he was hiding in the woods (laughing). Mitch: Because he didn’t want to come home. Dawn: He didn’t want to come home (laughing). Dawn and her brother Michael fell in love with Special Days Camps. It was here that Dawn discovered her passion for nursing and when she is not working at Detroit Children’s she is part of a skilled team of medical professionals at camp – helping to make life long memories for kids with cancer AND their families. Dawn Rauser Cross When the cancer kids are at camp we hardly ever see them. They don’t want to have anything at all to do with the nurses but the siblings after every meal will be lined up outside the med center because they want that little bit of one on one that full attention on them. Mitch: I imagine that sometimes they feel like all the attention goes to the sick brother or sister and they feel like they are forgotten. Dawn: Yeah, yeah absolutely so it’s a connection for them too. And creating connections is what Special Days Camps is all about. Special Days Camps is bringing laughter and joy to kids touched by cancer here in the heart of Detroit.